I'm rushing to write this post before the start of Shavuot. Shavuot, for the uninitiated, is the celebration of the Jewish people receiving the Torah at Mount Sinai. One of the ways we celebrate is eating dairy meals - Cheesecake, cheese blintzes, pizza. Anything cheesy or milky is fair game for Shavuot. What do Torah and dairy products have to do with one another? There are a variety of explanations for why we eat dairy on this holiday. Some say it is because the Hebrews in the desert ate dairy meals when they received the Torah because they had just been given the laws of kashrut (keeping kosher) and didn't yet have the time or resources to cook meat according to these laws, and dairy meals are less work. Others say it is because of King Solomon's words describing the Torah as "honey and milk are under your tongue" in the Song of Songs. Either way, this is probably the holiday that's least friendly towards the lactose intolerant, but the favorite of those who love all things cheesy. To celebrate I made a reduced fat, reduced cholesterol gluten-free baked ziti for my parents. My mother ate two servings of it, proclaiming its goodness, when I finally admitted that she had just eaten her least favorite food: tofu. Yes, once again I have convinced my mom to unknowingly eat tofu by disguising it as cheese. The combination of garlic powder, salt, nutritional yeast and silken tofu really do create that believable an imitation of ricotta - And of course cut down on the fat and cholesterol, which was the point. I used real cheese too, of course - Shredded parmesan and reduced fat Sorrento mozzarella, which is kosher and is lower fat than regular part-skim mozzarella. Tinkyada noodles were my pick for the ziti, as they stay firm even when baked. The result was a delicious baked ziti that's plenty cheesy without being overwhelmingly rich. Serve this to your friends and smile smugly as you watch them devour it without realizing it's gluten-free and has tofu in it... I mean, if you are evil like me, that is. Bring a pot of water to a boil. When it comes to a boil, add a small amount of salt and all of the noodles. Boil the noodles until al dente - They should not be mushy. Drain and rinse with cold water, set aside. Preheat oven to 425 F.In a small bowl mash silken tofu with the back of a fork, along with garlic powder, kosher salt and nutritional yeast. In a separate bowl, mix parmesan and mozzarella cheese together. Remove 1/3 of the cheese mixture and add it to the tofu mixture, stirring well to combine. In a large pan, heat olive oil over medium-high heat. Add onions and sautee until golden-brown. Add garlic and sautee for 1-2 minutes. Add mushrooms and sautee until fully cooked. Mix in marinara sauce and simmer over low heat until very hot. Remove from heat. 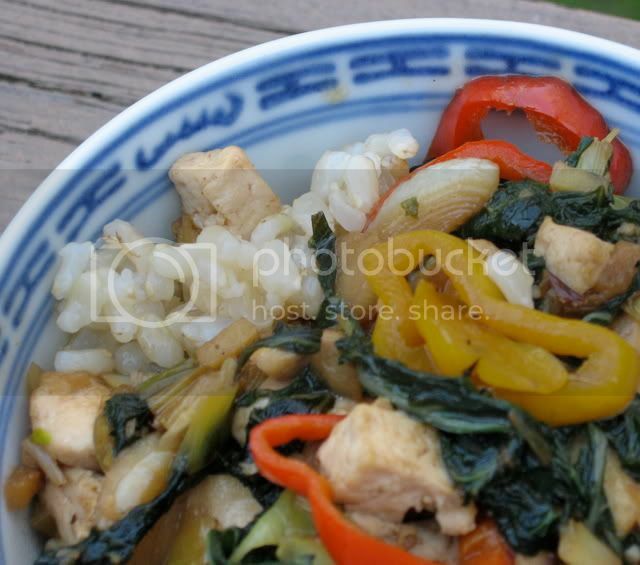 Stir tofu "ricotta" mixture into the pan with the sauce, then carefully stir in noodles. Pour the entire mixture into a medium baking dish that is coated with olive oil or non-stick spray. Cover with remaining cheese. Place in heated oven and bake for 10 minutes or until cheese is melted. Place under broiler (not too close to the flame or heating element) for 5 minutes or until the cheese is bubbly and browned. Serve hot. Gluten-Free By The Bay, Two Time Silver Medalist! 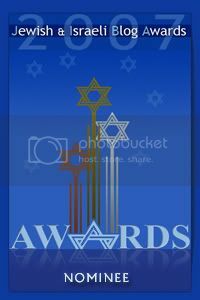 I am thrilled to announce that this blog came in second place in both Jewish Blog Award categories it was nominated for. The first award is in the Best Kosher Food/Recipe Blog category. The second award was for my post The Gluten-Free Passover Recipe Roundup 2007. Considering that a niche blog such as this one was running against popular, more broadly focused blogs that have been around much longer, as well as a blog that is run by a major organization, winning second place was quite a feat. I appreciate all of your support and your votes. 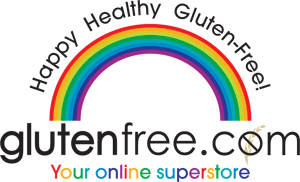 My hope is that just by being nominated and listed on the JIB Awards site I helped provide more visibility for the prevalence of celiac disease and gluten intolerance in the Jewish community and the availability of delicious gluten-free kosher and Jewish foods. Mazel tov to The Jew and the Carrot and Two Heads of Lettuce! Oh, did you think I was going to stop posting recipes forever? Heck no. I'm back... well rested and beginning to settle into my new East Coast life, and excited to start posting recipes again. For the Mother's Day luncheon I prepared this morning for my mother, grandmother, godmother and some other family members and friends, I served a green salad with pears and goat cheese and blackberry vinaigrette, a broccoli and smoked cheddar frittata, fruit salad with lime-honey-ginger sauce, and two soccas-- one topped with kalamata tapenade and the other with this delicious spread, which was inspired by a recipe of my dad's. A delicious meal, so filling that we had little room for dinner even at 8pm. How do I describe this roasted garlic, artichoke and white bean spread to you? Is it more compelling for me to tell you that I can eat it by the spoonful or to tell you that I might like it more than hummus, which is one of my favorite foods? Oh, just try it. It is rich, buttery and full of flavor, and works well as a spread on everything from crostini to bagels to flatbreads, as a sandwich spread, and as a dip for vegetables of all sorts. If you're like me, you will clean out the inside of the food processor with your finger so that you don't waste even a drop of this stuff. I've heard that roasted garlic can now be purchased bottled or in tubes or something like that. If you don't have the patience for roasting garlic yourself you can give that a shot - But it's really so easy to do it yourself. You can use your toaster oven to save energy and time. And of course, there's nothing like the sticky-sweet garlic fingers you get from squeezing the caramelized garlic out of each clove. This can be made without wine for the non-drinkers in the house, and with extra olive oil for those who don't like to skimp on such things. Preheat oven to 375 F. Cut about 1/4" from the top of the head of garlic so that the very top of each clove has been removed. Brush the entire head lightly with olive oil, wrap well in tin foil, and bake for 1 hour or until the cloves are soft and the edges are brown and caramelized. Remove from oven, unwrap, and cool. In a heavy medium pan, heat two tablespoons of olive oil over medium-high heat. Add onion and rosemary, and sautee until the onion is well browned but not burnt. In food processor, combine rinsed and drained beans, drained artichoke hearts, contents of the pan, and all other ingredients, including the entire head of roasted garlic (use your fingers to squeeze the softened garlic out of each clove). Add a generous amount of freshly ground black pepper. Puree until completely smooth. Adjust seasonings, olive oil and wine to taste. Serve at room temperature. Because of the stress of moving, and my need to take a break from cooking for the blog rather than cooking for myself, I haven't been recording recipes for much of what I've been cooking. I have, however, been cooking. 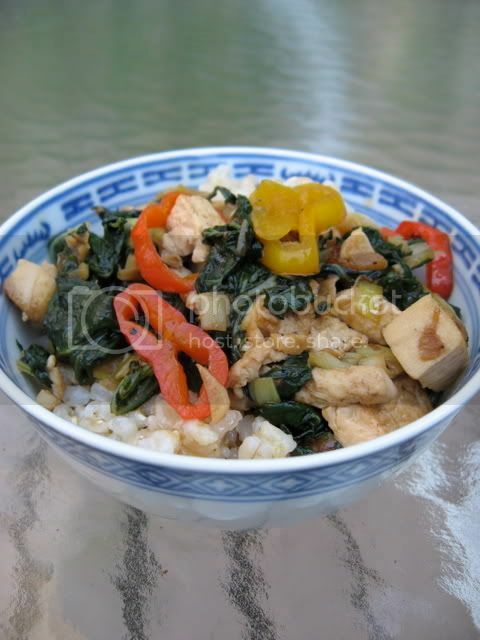 For instance, last week I put together this stir-fry of swiss chard, red bell peppers, garlic and leeks with browned tofu and a sauce of gluten-free hoisin sauce, soy sauce and sesame oil. I pride myself on converting tofu-haters to tofu-lovers or tofu-tolerators. Same thing for quinoa. What food do you think your cooking could convince a hater to change their mind about? 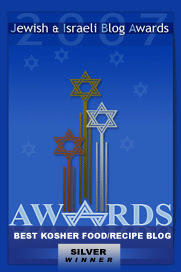 Please Vote for This Blog in the Jewish & Israeli Blog Awards! Hi everyone... I have some exciting news. This blog is a nominee in two categories of the 2007 Jewish and Israeli Blog Awards. To vote for Gluten-Free Passover Recipe Roundup 2007 as the Best Kosher Food Blog Post, click here. 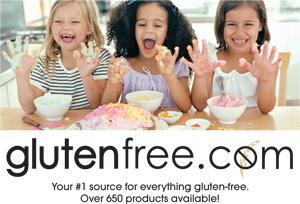 To vote for Gluten-Free By The Bay as the Best Kosher Food/Recipe Blog, click here. You have until May 16 to vote. Many thanks to all of you for supporting me, and this blog! 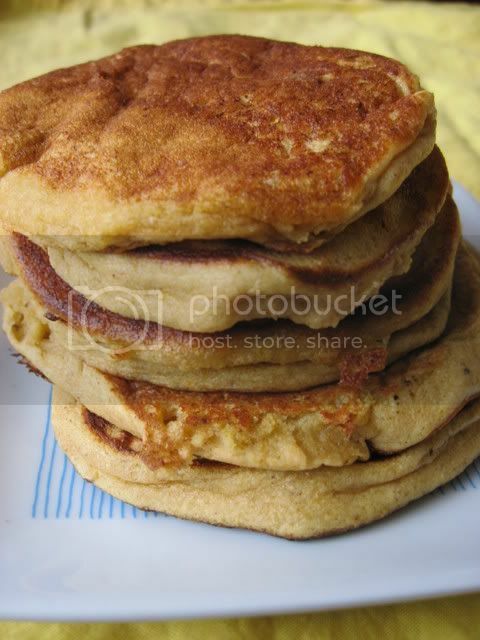 So I've been wanting to share these pictures of some delicious plantain pancakes I made, but since I lost the paper where I wrote down the (fabulous) recipe, I've been putting off posting the photographs. 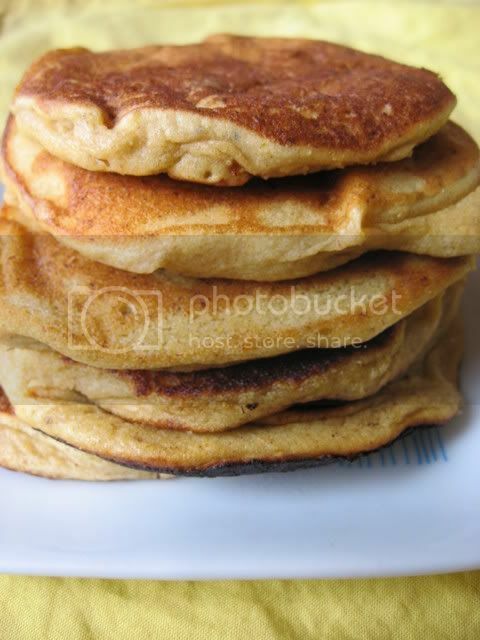 It's been so long that I've decided to just go ahead and post the photos sans recipe (*ghasp! *) When the two new plantains that are sitting on my counter ripen fully I will just have to recreate and rewrite the recipe, and I'll post it to share with you all at that time. Yes, they are really delicious enough to warrant this recipe recreation project. In the mean time, I taunt you with some yummy photos. I'm loving my new upstate New York life so far. Gardening tons (I've planted so many vegetables, and the lettuce and spinach is already coming up). Stretching a lot. Sleeping a lot. Working a little. Just bought my first car. And oh, yes, cooking for my parents. I am earning my keep, I suppose you could say. Hello all my dear readers. I am not gone, simply on vacation. I have finally landed in the beautiful Hudson Valley and am settling in slowly but surely. The weather is beautiful - I get to have a second magnolia season, since in Oakland they bloomed in February and here they are just now blooming. Lovely. I am busy unpacking, getting more comfortable driving (I just got my first ever driver's license 10 days ago, believe it or not... and now I've been plunked down in a place with no public transit), reconnecting with old friends, and enjoying the outdoors. Getting ready to put in a nice little vegetable garden, too. It will probably be a few more days before I can offer you a new recipe or product review, but I think of you all often and look forward to getting back on the blogging wagon shortly. Thanks for sticking around, and all the well wishes you offered me for this big move.